Theoretically, you should aim for a long finish angle combined with a low value of “wash”. That is a clear, clean tap-down. Trying to improve a real sculler, though, one has to ask the question how much gain can be achieved by working on this parameter. The new “Trend Flex” chart on rowsandall.com can be used to find the answer. The first thing I looked at was the effect of “Wash” on efficiency. 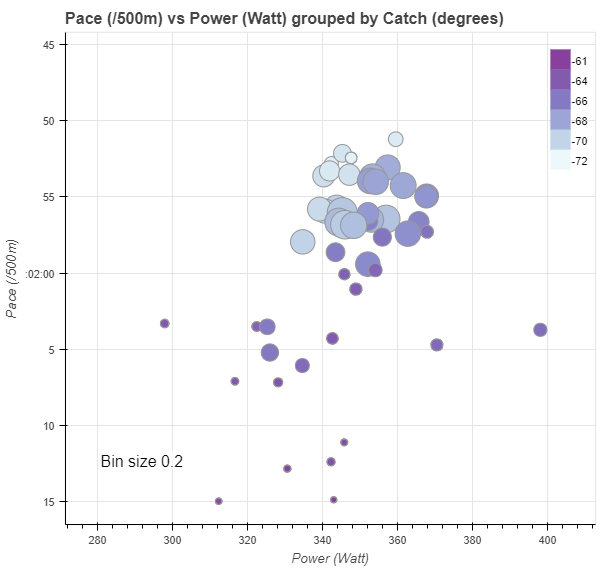 To do that, I plot the boat speed (“pace” in seconds/500m) as a function of Power. Of course, you go faster by increasing power, so just looking at the highest boat speed is not enough. In terms of efficiency, what we are trying to achieve is getting maximum speed at minimum power. In the chart below, this means that the top left is where you want to be. To focus on race pace, I selected all my rows between May 1 and today, but only look at stroke rates above 30spm, and I also restricted Work per Stroke to 400 J. This last condition removes technical exercises where I am paddling at high spm but with short strokes. Then, I used the power of the Trend Flex chart to group the strokes by the Wash value, lumping together in groups with a size of 0.2 degrees. 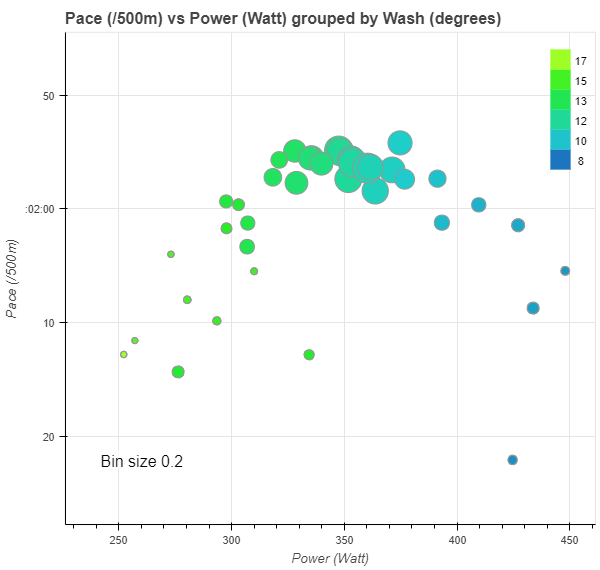 The result is this very interesting chart: The size of the bubbles indicates the number of strokes at that value of Wash. You can see in the chart that at high values of wash (at high power), the pace drops, and at low power and wash the pace drops as well. But between roughly 10 and 13 degrees of wash, the average pace achieved is roughly constant. 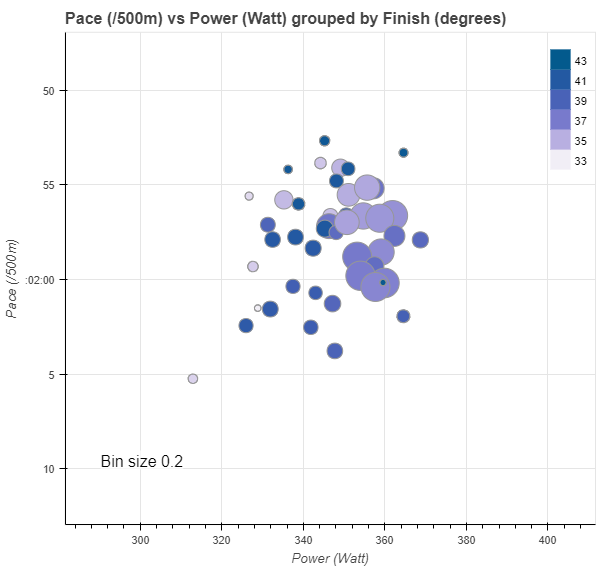 One of the assumptions here is of course that the averages are a fair mix of tailwind and headwind. I think this is a valid assumption. From my regular monitoring of these values, I know that wash values tend to be “worse” in rougher conditions (choppy water), but that is true interdependent of the wind direction. At the high end of this plateau, I seem to achieve the same boat speed at a lower power. My hypothesis is that this is me rowing more “relaxed”, without forcing a big strong finish. The tentative conclusion is that I shouldn’t worry too much about Wash, as long as it is in the 10 to 13 degrees range, and I should just row my most comfortable stroke. However, one should look at the entire mix of metrics to validate the story. The next picture is the same set of strokes, but now grouped by the finish angle. Again, it is good to be in the top left of this group of bubbles. However, I see a mix of low and high finish angles there. No significant dependence. Then, I look at the drive length. Clearly, a longer drive length makes me faster. 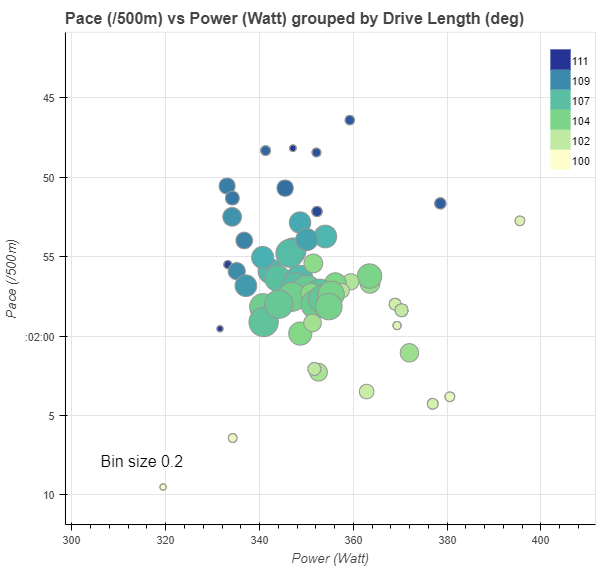 As a test, I also look at the effective drive length, which takes into account the values of slip and wash. 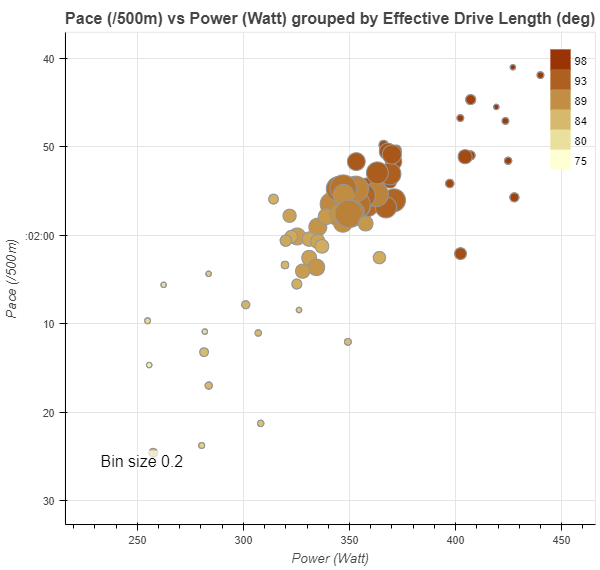 Funny enough, this seems to straighten the curve and generate a more clear relation between power and pace, without any clear trend for the effective drive length. Finally, I look at the catch angle, and there I see a clear trend again. I have not moved my footstretcher over the past three months, so this is really a measure of the length of my reach. When I reach longer (-70 degrees and less), I am rowing more efficient. The only caveat here may be that it is easier to reach longer in tailwind conditions. I think I shorten up slightly in strong headwinds, so the question is what is the cause and what is the effect. In conclusion, I shouldn’t worry too much about my Wash values, and a long stroke is a good stroke. If you row with a Empower Oarlock, I encourage you to try this analysis on your own rowing, because the results may be different, depending on your skill level.